The Maltz Jupiter Theatre opened its production of Thoroughly Modern Millie on March 5, 2013. 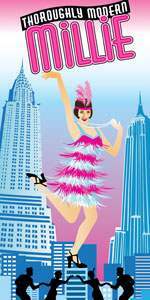 A high-spirited musical romp that has all of New York dancing the Charleston, Thoroughly Modern Millie tells the story of a small-town girl who travels to New York City to marry for money instead of love. Come relive the roaring 1920s in this Tony Award®-winning musical featuring jazz, thunderous tap dancing, frisky flappers and dashing leading men! Mark S. Hoebee directed a cast that included Laurie Veldheer, Ashley Kate Adams, Brenda Braxton, Jeff Kready, Burke Moses, Lenora Nemetz, and Amy Van Norstrand. Thoroughly Modern Millie is just what it wants to be: a silly romp so frothy you’d think you just stepped into a bubble bath. Make that bathtub gin. Mark S. Hoebee, producing artistic director at the Paper Mill in New Jersey, guides the vivacious cast in this spoof of contrived 1920s musicals – masking the fact that a lot of skilled hands and considerable resources have been invested in this highly polished product. Veldheer... exudes Millie’s cross of shaky self-confidence and appealing vulnerability reminiscent of Rachel McAdams. Besides being a full-throated singer and fine dancer, the petite blue-eyed Veldheer has the charisma needed to hold her own alone on stage for wistful solos... This is the role that made the phenomenal Sutton Foster a from-the-chorus-to-overnight-star. While it might not catapult Veldheer as high, anyone who sees her work here will remember her for a long time to come. ...if you yearn for the good old days when musicals made little sense and their cartoonish plots were little more than excuses to get from one production number to the next, then, boy, has the Maltz Jupiter Theatre got a show for you. It is Thoroughly Modern Millie, based on the Julie Andrews-Mary Tyler Moore movie from the ’60s. That was a carefree celebration of the flapper era influenced by the homage musical The Boy Friend, the show that first brought Andrews to our shores in 1954. In the title role here, the Maltz has its own star-in-the-making... Veldheer is perfectly cast, having a belter’s singing voice, a wicked way with a Charleston and a charm that is catnip to the male characters and most of the audience. Burke Moses... has a firm grasp of the ridiculous... things turn truly nutty when we meet Mrs. Meers.... a shameless, anything-for-a-laugh Lenora Nemetz. Mark S. Hoebee, producing artistic director of New Jersey’s Paper Mill Playhouse, stages the show with efficiency, but takes a back seat to choreographer Denis Jones, a Carbonell winner for the Maltz’s take on The Boy Friend few seasons ago. Helen Gregory leads a swinging hot band and Michael Schweikardt contributes a stylish set design dominated by a swank New York skyline. Thoroughly Modern Millie plays at the Maltz Jupiter Theatre through March 24, 2013.